Lock it down with BOLT! Only BOLT delivers superior security for your rig, hitch, and spare tire with the convenience of one-key access! The engine oil repair formula that made us the #1 brand for all oil leaks stemming from the rear main seal, timing cover, cam seal and anywhere else you'll find troublesome oil leaks! Hot Shot’s Secret Diesel Extreme is a new and powerful formula designed to rejuvenate your diesel’s fuel system’s performance. One treatment of FR3 to your oil and your diesel will run cooler and have increased towing power. Stiction Eliminator will stop excessive black smoke and bucking and chugging on cold starts. It not only cleans injectors but other parts of the engine as well, including the turbocharger. This concentrated cetane improver upgrades power and performance in all diesel equipment, increasing fuel and maintenance economy. (NARRATOR)>> OUT FOR A LEISURELY DRIVE AND SEE OUR TRUCK COMING? YOU BETTER GET HOME QUICK. WE'RE BRINGING BACK DRIVEWAY RESCUE. PLUS FORD OR RAM? THE GUYS CHOOSE THEIR NEXT DIESEL PROJECT. THAT AND MORE RIGHT NOW ON TRUCK TECH. (JEREMY)>> WE GET LETTERS FROM YOU GUYS ALL THE TIME ASKING US TO HELP YOU OUT WITH YOUR PROJECTS. WELL WE USED TO HAVE THIS LITTLE SEGMENT CALLED "DRIVEWAY RESCUE". WELL WE'RE BRINGING IT BACK. (LT)>> NOW WE'RE GONNA PUTTING ON A LOT OF MILES TO GET TO EACH OF YOUR PROJECTS TO HELP YOU OUT. SO WE NEEDED A VEHICLE WHERE WE COULD CARRY ALL OF OUR TOOLS, EQUIPMENT, AND SPARE PARTS. SO WE PICKED UP THIS, A NISSAN NV 2,500 HD. (JEREMY)>> THE FIRST THING WE'RE GONNA DO IS TAKE CARE OF THIS BIG, WHITE BLANK CANVAS. WE'RE GONNA GET IT WRAPPED. THE WRAP LAB IS JUST DOWN THE STREET FROM THE TECH CENTER. THEY SPECIALIZE IN CUSTOM GRAPHICS FOR JUST ABOUT ANYTHING. IT STARTS WITH A TEMPLATE OF THE VEHICLE AND GOES FROM THERE. WE SUPPLIED THEM WITH OUR DIGITAL ASSETS AND THEY LAID THE WHOLE THING OUT. (LT)>> ONCE WE GAVE THEM THE OKAY, PRODUCTION STARTS BY PRINTING OFF ALL THE PANELS. THEN A U/V CLEAR LAMINATION FILM GOES ON BEFORE IT'S ALL TRIMMED, AND THE GUYS CAN BEGIN INSTALLATION, MAKING SURE EVERYTHING IS LINED UP PERFECTLY. ALL RIGHT, THE GUYS AT THE WRAP LABS DID A FANTASTIC JOB ON OUR VAN. IT'S LOOKING PRETTY GOOD, AND THEY TURNED IT AROUND IN JUST A COUPLE OF DAYS. THE VAN'S PRETTY MUCH READY TO ROCK, BUT WE DO HAVE ONE PROBLEM OUT BACK. ALL OF THE POWERNATION SHOWS ARE GOING TO BE A PART OF DRIVEWAY RESCUE. WE'RE GONNA COME TO YOUR HOUSE AND HELP YOU OUT ON A PROJECT THAT YOU MIGHT BE STUCK ON. TO DO THAT WE'RE GONNA BE CARRYING AROUND A MOBILE WORK SHOP IN THE BACK OF THIS VAN. TO HELP YOU OUT WE'RE GONNA BRING ALONG WELDERS, GENERATORS, AND JUST ABOUT EVERY TOOL IMAGINABLE. THE PROBLEM IS THIS VAN IS JUST A BIG EMPTY BOX. WE HAVE NO GOOD WAY TO STORE AND ORGANIZE ALL OUR TOOLS. LUCKILY NISSAN COMMERCIAL OFFERS A TURN KEY SOLUTION. WITH THE HELP OF THEIR WEBSITE, YOU CAN CONFIGURE THE CARGO AREA FOR MANY DIFFERENT APPLICATIONS. YOU CAN CHOOSE ORGANIZATION BASED UP ON VOCATION, LIKE HVAC, OR IF YOU'RE A GENERAL CONTRACTOR. WE CHOSE THE BASE PLUS GENERAL SERVICES OPTION, AND THE NICE THING IS YOU CAN CUSTOMIZE YOUR CARGO AREA ANY WAY YOU WANT RIGHT ON THE NISSAN COMMERCIAL WEBSITE. (JEREMY)>> ONCE YOU PLACE YOUR ORDER, THE COMPONENTS WILL SHIP DIRECTLY TO ONE OF THEIR AUTHORIZED SERVICE INSTALLERS. FROM THERE THEY WILL CUSTOM ASSEMBLE RACKS, PARTITIONS, EVERYTHING YOU'LL NEED TO KEEP YOUR TOOLS IN PLACE EXACTLY THE WAY YOU WANT IT BECAUSE LET'S FACE IT. WHEN YOU'RE DRIVING DOWN THE ROAD IT'S REALLY HARD TO KEEP THE TOOLS FROM FLYING ALL OVER THE PLACE. SO THE DRAWERS, THE BINS, AND THE SHELVES WILL HELP KEEP EVERYTHING RIGHT IN PLACE AND MAKE IT EASY TO FIND. NOW IT'S UP TO YOU TO FILL IT WITH THE TOOLS YOU'LL NEED. OF COURSE WE CALLED MATCO TOOLS, WHO SUPPLIED US EVERYTHING WE'LL NEED FOR OUR MOBILE SHOP. WELL ALL RIGHT, LOOKS PRETTY COOL! NOW WE'VE STILL GOT A FEW MORE TOOLS WE WANT TO ADD, BUT FOR THE MOST PART WE'VE GOT ENOUGH IN HERE TO GET MOST JOBS DONE. NOW WE COULDN'T BE MORE PLEASED WITH HOW EVERYTHING FITS, BUT WHAT'S REALLY COOL ABOUT THIS IS HOW MUCH ROOM WE HAVE. SO IF WE WANT TO THROW SOME WELDERS IN HERE, OR MAYBE SOME BIGGER TOOLS, IT'LL BE A PIECE OF CAKE. (LT)>> WE'VE PARTNERED WITH ROCK AUTO DOT COM, WHO'S GOING TO FURNISH ALL THE REPLACEMENT PARTS THAT WE NEED TO GET YOUR CAR OR TRUCK BACK UP AND RUNNING. THEY ARE THE SOURCE FOR OEM, OR FACTORY REPLACEMENT PARTS, FOR JUST ABOUT ANYTHING ON FOUR WHEELS, BUT RIGHT NOW IT'S UP TO YOU. (JEREMY)>> VISIT POWERNATION TV DOT COM AND CLICK ON THE DRIVEWAY RESCUE TAB. 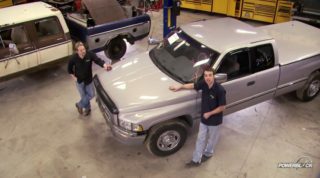 FROM THERE WE'LL ASK YOU A FEW QUESTIONS, LIKE YEAR, MAKE, AND MODEL OF YOUR VEHICLE AND WHAT SPECIFICALLY YOU NEED HELP WITH. (LT)>> LET'S SAY YOU'VE GOT A JEEP OR AN OLD PICK UP THAT'S WEARING THE FRONT END A LITTLE BIT FUNNY. MAYBE YOU NEED SOME BALL JOINTS, BUSHINGS, OR TIE RODS PUT IN, OR YOUR CARRIER BEARING WENT OUT ON YOUR DRIVESHAFT. (JEREMY)>> OR LET'S SAY YOU NEED A NEW DISTRIBUTOR AND NEED HELP WITH INSTALLATION. 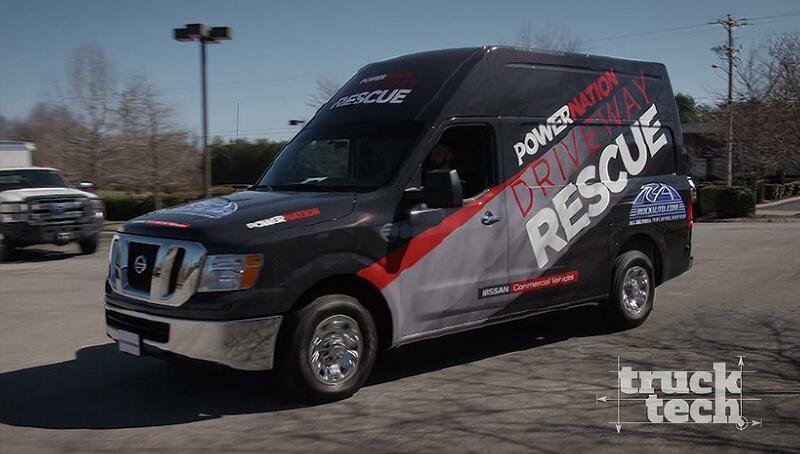 ALL OF OUR POWERNATION SHOWS WILL BE HITTING THE ROAD THIS SEASON IN THE NV TO LEND YOU A HAND, AND THAT MEANS PUTTING YOU ON TV TOO. (LT)>> WE'LL WALK YOU THROUGH THE REPAIR PROCESS, AND HOPEFULLY YOU'LL GET YOUR HANDS DIRTY AND HELP US OUT FINISHING THE REPAIR. (NARRATOR)>> NEXT, POWERSTROKE OR CUMMINS? (JEREMY)>> WELL ALL RIGHT MAN, I'M A LITTLE SCARED BECAUSE I'M WORKING AWAY IN THE SHOP, I'M KINDA DOING MY OWN THING, AND THEN YOU DRAG ME OUT HERE INTO THE TRUCK. AND NOW WE'VE BEEN ON THE ROAD FOR A LITTLE BIT, AND I'M STARTING TO WONDER WHERE YOU'RE TAKING ME. (LT)>> DON'T YOU LIKE SURPRISES? (JEREMY)>> NOT WHEN YOU'RE GIVING THEM I DON'T. (LT)>> WELL WE'RE HALF WAY THROUGH THE SEASON OR SO. 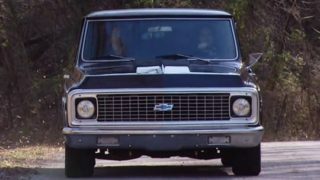 YOU KNOW, THE F-100'S KINDA WRAPPING UP, MODELA, THAT'S GOT A LONG WAYS TO GO, AND THE BLAZER. JUST BOTH OF THOSE PROJECTS INVOLVE A LOT OF BODY WORK AND PAINT, AND I WANTED TO GIVE YOU A BREAK FROM IT. SO I'VE TAKEN THE LIBERTY AND I'VE NARROWED IT DOWN TO TWO PROJECT VEHICLES, AND WE'RE GONNA GO LOOK AT THEM. (JEREMY)>> ALL RIGHT. WELL, YOU KNOW, IF I WAS GONNA PICK A PROJECT, YOU KNOW WHAT IT WOULD PROBABLY BE. IT'D BE SOMETHING A LITTLE OLDER, YOU KNOW, AND KNOWING YOU AND THE STUFF YOU LIKE I HAVE FEELING WE'RE NOT IN THAT BALLPARK. (LT)>> NOT EXACTLY! IT'S ACTUALLY VERY FAR FROM THE '30 TO '70 RANGE, BUT I AM A NICE GUY. SO LIKE YOU SAID, I AM GONNA LET YOU PICK. THAT'S THE BEAUTY OF THIS. NOW I'LL GIVE YOU A HINT. WE JUST DID A DURAMAX LAST YEAR. SO IT'S NOT GOING TO BE A DURAMAX. (JEREMY)>> THAT'S WHERE I THOUGHT THIS WAS GOING. SO I HAVE A COUPLE OF IDEAS, BUT BEFORE I THROW ANYTHING OUT THERE I'LL WAIT. I'LL SEE WHAT YOU HAVE SITTING THERE, BUT I'VE GOT A GOOD FEELING IF I PUT MONEY ON THIS I'D WIN. (LT)>> SEE, RIGHT OVER THERE? (JEREMY)>> MAN LOOK AT THAT. (LT)>> SOME GOOD LOOKING MACHINERY. I'VE GOT TWO DIESEL TRUCKS FOR YOU TO CHOOSE FROM. WE'VE GOT A 2017 FORD F-250 AND A 2016 RAM 3,500. THEY ACTUALLY BOTH HAVE A SIX POINT SEVEN LITER DIESEL. THEY'RE BOTH SIX SPEED AUTOMATICS, AND THEY'RE BOTH FOUR WHEEL DRIVE. SO WHAT DO YOU THINK? (JEREMY)>> WELL I LIKE BOTH OF THE TRUCKS YOU PICKED OUT. I LOVE THE FORD BECAUSE THAT'S ONE OF THE MOST POPULAR TRUCKS OUT THERE AND I LIKE THE LOOKS OF IT, BUT WHAT I THINK IS COOL IS THE FACT THAT YOU PICKED A DUALLY BECAUSE WE HAVEN'T WORKED ON ONE OF THOSE YET. SO I GUESS THE QUESTION IS, ARE YOU REALLY GONNA LET ME PICK ONE OF THEM? 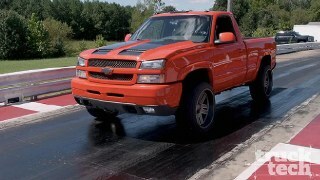 (LT)>> WELL SINCE THERE IS NO DURAMAX HERE TO CHOOSE FROM, IT IS 100 PERCENT UP TO YOU. (JEREMY)>> ALL RIGHT, I THINK I KNOW WHICH ONE I WANT BUT I NEED TO GET BEHIND THE WHEEL FIRST. (LT)>> WELL WHAT DO YOU WANT TO DRIVE FIRST? (JEREMY)>> LET'S TAKE THE FORD. (JEREMY)>> GIVE ME THOSE KEYS. (LT)>> WHOA, LOOK OUT MAN, THERE'S A DOG! (JEREMY)>> WELL ALL RIGHT MAN. YOU'RE GONNA HAVE TO FILL ME IN A LITTLE BIT AND LET ME KNOW HOW YOU GOT BOTH OF THESE NEW PICK UP TRUCKS. (LT)>> WELL IT'S LIKE THEY SAY, IT'S NOT WHAT YOU KNOW, IT'S WHO YOU KNOW, AND I'VE GOT A GUY. (JEREMY)>> WELL I THINK I NEED TO KNOW THIS GUY. (LT)>> ALL RIGHT MAN, WELL RIGHT OFF THE BAT WHAT DO YOU THINK OF THE FORD? (JEREMY)>> MAN RIGHT OUT OF THE GATE THIS THING IS CRAZY TORQUEY, INSTANT RESPONSE. (LT)>> WELL IT SHOULD BE. 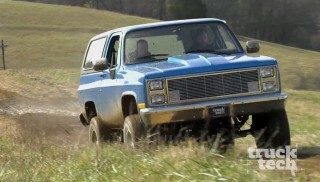 THIS TRUCK'S ACTUALLY RATED AT 440 HORSEPOWER AND 925 POUNDS OF TORQUE. ACTUALLY RIGHT NOW THIS IS THE MOST POWERFUL DIESEL PICK UP YOU CAN BUY. THE RAM ACTUALLY COMES IN AT JUST A LITTLE BIT LESS, 385 HORSEPOWER, 900 POUNDS OF TORQUE. 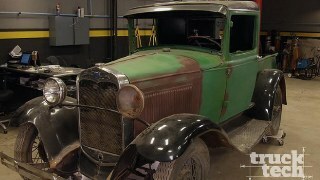 (JEREMY)>> WELL SOMETHING ELSE I REALLY NOTICED ABOUT THIS FORD IS THE STEERING'S REALLY TIGHT, THE SUSPENSION FEELS GOOD. I MEAN IT'S ALMOST LIKE YOU'RE RIDING AROUND IN A SPORTS CAR, BUT WHAT'S REALLY COOL ABOUT THIS FORD TOO IS 2017 IS THE FIRST YEAR OF THE ALUMINUM BODY. SO IT CUTS DOWN ON WEIGHT A LITTLE BIT BUT IT'S STILL DURABLE. I THINK THAT'S A REALLY COOL OPTION. THIS IS ONE OF THOSE TRUCKS WHERE I'M SITTING IN IT, I'M LOOKING AROUND, THERE'S SO MANY BUTTONS, THERE'S SO MANY FEATURES. IT'S SO NICE IT'S, DO YOU REALLY WANT TO THROW ANYTHING IN THE BED OF THIS TRUCK? I MEAN I DON'T KNOW. IT'S ALMOST TOO NICE FOR ME. (LT)>> THINK ABOUT IT. WE'VE GOT FOUR CUP HOLDERS, EVERY POWER OPTION YOU COULD IMAGINE. (JEREMY)>> I'LL TELL YOU WHAT, FORD KNOCKED IT OUT OF THE PARK ON THIS ONE. THIS IS A REALLY, REALLY AWESOME TRUCK. (LT)>> WELL TELL YOU WHAT THOUGH. IF YOU DON'T PICK THIS ONE I JUST MIGHT HAVE TO TAKE THIS FOR MYSELF. (NARRATOR)>> JEREMY RIDES THE RAM, THAT'S NEXT! (LT)>> WE'RE BACK ON TRUCK TECH, WHERE JEREMY AND I TEST DRIVE TWO POPULAR HEAVY DUTY DIESEL HAULERS. (JEREMY)>> SO FAR I GAVE THIS 2017 FORD SUPER DUTY HIGH MARKS FOR ITS BEST IN CLASS POWER AND CREATURE COMFORTS. NOW I'LL GET BEHIND THE WHEEL OF A 2016 RAM 3,500 AND I'LL PICK THE ONE I LIKE BEST. (LT)>> ALL RIGHT MAN, SO WHAT DO YOU THINK OF THE RAM SO FAR? IT'S A DUALLY, IT'S A BIG LONG TRUCK, BUT WHAT DO YOU SAY? (JEREMY)>> I'LL TELL YOU WHAT, THERE'S NO DENYING THAT. THIS TRUCK IS MASSIVE MAN, BUT YOU KNOW WHAT? SO FAR I REALLY LIKE THE WAY IT DRIVES. IT FEELS GOOD. IT'S A LITTLE ON THE STIFF SIDE BUT YOU KNOW MOST OF THESE TRUCKS ARE THAT WAY. (LT)>> WHAT DO YOU THINK OF THE POWER THOUGH? (JEREMY)>> I MEAN RIGHT OUT OF THE GATE, JUST STOMPING ON A LITTLE BIT, YOU FEEL HOW MUCH TORQUE IT HAS. I MEAN YOU CAN TELL THIS TRUCK, JUST RIGHT OUT OF THE BOX, HAS A DECENT AMOUNT OF POWER. (LT)>> YEAH, I MEAN 900 POUNDS OF TORQUE IS A LOT, BUT THE COOL THING IS HOW RESPONSIVE IT IS. THERE'S REALLY NOT A LOT OF TURBO LAG IN A TRUCK LIKE THIS. THEY'VE SIZED THE TURBO PROPERLY. SO AS SOON AS YOU HIT IT IT'S RIGHT THERE. I MEAN LOOK AT THAT! 2,000 RPM AND IT'S JUST PULLING. (JEREMY)>> A PARKING GARAGE MAYBE. (LT)>> OKAY, GREAT POINT. WHAT ABOUT PEOPLE WHO ARE LOOKING FOR A TRUCK THAT MAYBE AREN'T HAULING SOMETHING EVERYDAY BUT WHAT ABOUT LIKE EITHER ONE OF THESE TRUCKS FOR A DAILY DRIVER. HOW WOULD THE DODGE BE? (JEREMY)>> GOOD QUESTION. NOW DAYS THINGS HAVE ADVANCED A LITTLE BIT, AND THESE TRUCKS, THEY USED TO GET REALLY BAD FUEL MILEAGE. THEY GET A LOT BETTER FUEL MILEAGE NOW. SO I THINK IT'S A LITTLE EASIER TO HAVE ONE OF THESE AS A DAILY DRIVER AND NOT DRAIN YOUR WALLET, BUT HONESTLY THEY RIDE ROUGH. THEY'RE REALLY BIG. IT'S HARD TO GET IN A PARKING LOTS, NO PARKING GARAGES. (LT)>> IT TAKES A TRUE MAN TO ROCK A DUALLY EVERY SINGLE DAY. (JEREMY)>> AIN'T THAT THE TRUTH? NOW ALTHOUGH THE FORD WAS A REALLY COOL TRUCK, I JUST COULDN'T HELP MYSELF. I HAD TO PICK THIS ONE BECAUSE LIKE I SAID A LITTLE EARLIER, WE HAVEN'T HAD A DUALLY IN THE SHOP. SO IT'LL BE A LITTLE BIT OF A CHANGE OF PACE FOR US, AND I CAN DEFINITELY SEE THE POTENTIAL IN THIS ONE, BUT I DO HAVE ONE QUESTION? (JEREMY)>> THERE ARE A LOT OF MILES ON THIS TRUCK. SO HOW DID THEY ALL GET THERE? (LT)>> ALL RIGHT, WELL THE MAN THAT OWNED THIS TRUCK ACTUALLY DID HOT SHOT TRUCKING. HE HAULED CAMPERS AND TRAVEL TRAILERS ALL AROUND THE COUNTRY FROM INDIANA. HE ACTUALLY AVERAGED ABOUT 350 MILES A DAY. THIS TRUCK HAS 177,000 MILES ON IT, BUT IT'S BEEN VERY WELL TAKEN CARE OF. (JEREMY)>> I WAS GONNA SAY, IT'S DEFINITELY BEEN USED, BUT AT LEAST HE TOOK CARE OF IT. 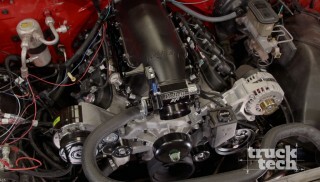 (LT)>> YOU KNOW ANOTHER REASON WHY I'M EXCITED HE CHOSE THE SIX POINT SEVEN LITER CUMMINS IS THE PERFORMANCE POTENTIAL. YOU KNOW, BASICALLY AS CREATIVE AS WANT TO GET, WE HAVE FREE LICENSE. WE COULD PUMP THIS THING UP TO 1,000 HORSEPOWER OR JUST PUT A TUNER ON IT AND GET IT 50 OR 100 MORE. (JEREMY)>> YEAH, IT'S ENDLESS WHAT WE COULD DO THERE, BUT NOT ONLY THAT THE EXTERIOR AS WELL. WE CAN DEFINITELY MAKE THE OUTSIDE OF THIS THING MATCH OUR PERFORMANCE. (LT)>> GOT ONE WORD FOR YOU. (JEREMY)>> WE CAN MAYBE DO THAT. (NARRATOR)>> AND WE CAN MAYBE DO A DYNO RUN TO GET A BASE LINE, THAT'S NEXT. 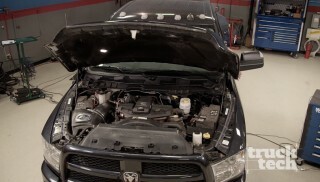 (LT)>> BEFORE WE DO ANYTHING TO THIS 2016 RAM, OUR BRAND NEW PROJECT TRUCK, WE WANT TO MAKE SURE THAT EVERYTHING UNDER THE HOOD IS RUNNING IN TIP TOP SHAPE. NOW OUR TRUCK DOES HAVE SOME MILES ON IT, ESPECIALLY CONSIDERING IT'S ONLY A 2016. AND AS THOSE MILES RACK UP, HEAT INSIDE THE ENGINE WILL CAUSE THE OIL TO TURN INTO A SLUDGY RESIDUE THAT'LL STICK TO MOVING PARTS LIKE TURBO BEARINGS, PISTON RINGS, AND EVEN IN THE FUEL SYSTEM. NOW ESPECIALLY IF THE PREVIOUS OWNER NEGLECTED TO SCHEDULE MAINTENANCE. SO I'M GONNA SHOW YOU AN EASY WAY TO CLEAN UP THAT MESS INSIDE THE ENGINE AND KEEP IT RUNNING THAT WAY. 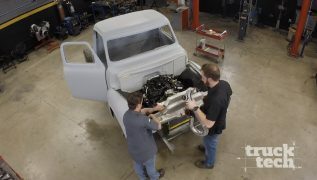 HOT SHOT'S SECRET HAS BEEN IN THE DIESEL GAME FOR A LONG TIME, AND THEY FIGURED OUT A PRETTY GOOD METHOD FOR KEEPING YOUR TRUCK RUNNING CLEAN. IN FACT THEY'VE DEVELOPED A TWO STEP PROCESS FOR CLEANING OUT YOUR FUEL SYSTEM AND YOUR ENGINE. ON A FIRST OIL CHANGE YOU WANT TO START OUT BY ADDING SOME STICTION ELIMINATOR. THIS WILL GIVE YOUR ENGINE A NICE INITIAL CLEAN OUT, AND REMOVE STICTIONS FROM ANY MOVING LUBRICATED ENGINE PART. THEN ON YOUR NEXT OIL CHANGE YOU WANT TO RUN SOME FRTHREE FRICTION REDUCER, AND THIS IS WHERE THE MAGIC WILL HAPPEN. THEIR PATENTED NANO TECHNOLOGY ACTUALLY FILLS MICROSCOPIC VOIDS INSIDE THE ENGINE. THIS WILL REDUCE FRICTION AND REDUCE WEAR BY UP TO 43 PERCENT. IT'LL KEEP YOUR ENGINE OIL RUNNING COOLER, AND PROBABLY THE BEST PART IS THIS WILL INCREASE YOUR MILEAGE AND POWER BY FIVE PERCENT EACH. PLUS THIS TWO STEP TREATMENT ALSO WORKS ON GASOLINE ENGINES. ON A COMMON RAIL ENGINE LIKE OURS, OR REALLY ANY DIESEL FOR THAT MATTER, THE FUEL INJECTORS CAN BECOME CLOGGED, WHICH WILL RESULT IN POOR PERFORMANCE, EXCESSIVE SMOKE, BAD FUEL MILEAGE, AND EXTRA DPF REGENERATION. THE FIX IS TO POUR IN SOME DIESEL EXTREME TO THE FUEL TANK WHEN YOU FILL UP. THIS'LL CLEAN OUT YOUR ENTIRE FUEL SYSTEM, AND RESTORE YOUR ENGINE'S PERFORMANCE. PLUS IT ADDS LUBRICITY TO THE FUEL, AND IT'LL INCREASE YOUR CETANE BY SEVEN POINTS. THEN ON EVERY FILL UP AFTER THAT YOU WANT TO POUR IN SOME EVERYDAY DIESEL TREATMENT. THIS'LL MAINTAIN THAT SAME SEVEN POINT BUMP IN CETANE, AND IT PREVENTS ALL THOSE PROBLEMS FROM HAPPENING AND BUILDING UP IN YOUR FUEL SYSTEM IN THE FIRST PLACE. PLUS IT'LL ALSO GIVE YOU A LITTLE BOOST IN FUEL MILEAGE. ONE OF THE COOLEST THINGS YOU CAN DO UNDERNEATH YOUR CAR OR TRUCK IS TIG WELD A CUSTOM STAINLESS STEEL EXHAUST SYSTEM. THE TROUBLE IS STAINLESS IS KIND OF A DIFFICULT MATERIAL TO WORK WITH, AND IT HAS TO DO WITH ITS CHEMICAL MAKEUP. STAINLESS STEEL CONTAINS HIGHER AMOUNTS OF CARBON AND CHROMIUM THAN MILD STEEL DOES. THAT'S WHAT GIVES IT ITS SHINY APPEARANCE AND ITS CORROSION RESISTANCE. THE TROUBLE IS WHENEVER YOU HEAT THIS METAL UP TO WELD IT THE CARBON AND CHROMIUM WANT TO RISE TO THE SURFACE OF THE MOLTEN PUDDLE. 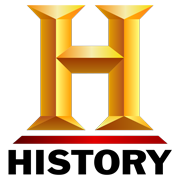 WHEN THAT HAPPENS THE ELEMENTS WILL REACT WITH THE OXYGEN IN THE ATMOSPHERE, OXIDIZE, AND CONTAMINATE YOUR WELDS. TO SHOW YOU WHAT I'M TALKING ABOUT I'M GONNA RUN A COUPLE OF PASSES WITH THE MACHINE SETUP IMPROPERLY. THEN YOU CAN SEE WHAT I MEAN. THE MACHINE IS SET TO WELD D/C BECAUSE THAT'S WHAT STAINLESS REQUIRES, BUT I'LL SET THE HEAT RANGE MUCH HIGHER THAN WHAT'S NEEDED. I'LL THEN RUN A FEW PASSES ON THE PIPE, INTENTIONALLY PUMPING IN A LOT OF HEAT MOVING SLOWLY. I'LL MAKE A COUPLE OF BEADS ABOUT A FEW INCHES LONG. NOW THAT PASS WAS MUCH TOO HOT FOR THIS THICKNESS OF MATERIAL, BUT IT REALLY ILLUSTRATES THE POINT THAT WE'RE GETTING AT. THIS DARK GRAY NASTY STUFF IS CALLED CARBIDE PRECIPITATION, AND IT'S THE LAST THING THAT YOU WANT TO SEE WHEN YOU'RE WELDING STAINLESS STEEL. IT MAKES FOR A VERY BRITTLE AND WEAK WELD SPOT. NOW THE TWO MAIN CAUSES ARE EXCESSIVE HEAT AND NOT ENOUGH SHIELDING GAS. SO I'LL START BY CORRECTING THE HEAT. A GOOD RULE OF THUMB IS TO USE ONE AMP OF CURRENT FOR EVERY THOUSANDTHS OF MATERIAL THICKNESS. THE PIPE IS 65 THOUSANDTHS THICK. SO I'LL SET THE MACHINE TO 65 AMPS. I'LL RUN A FEW MORE PASSES, AND TRY TO MOVE JUST A LITTLE BIT QUICKER SO THE MATERIAL DOESN'T SPEND SO MUCH TIME BEING HOT. WE CAN ALREADY SEE A HUGE IMPROVEMENT IN THE WELD QUALITY JUST BY HAVING THE APPROPRIATE AMOUNT OF HEAT FOR THE THICKNESS OF MATERIAL. THERE IS MUCH, MUCH LESS GRAY OXIDATION, AND EVEN TOWARDS THE TOP WHERE I STOP THERE'S A NICE KIND OF GOLD PURPLE COLOR GOING ON, BUT WE CAN STILL DO BETTER. WE JUST HAVE TO ADJUST OUR GAS COVERAGE. I'M SWAPPING OUT THE STOCK NUMBER SEVEN CUP TO A LARGER NUMBER 12 GAS LENS. THIS WILL GIVE US A LARGER SHIELDING AREA, DIRECT THE ARGON SMOOTHLY ONTO THE WELD, AND KEEP THE HOT MOLTEN STEEL PROTECTED LONGER. WE DO HAVE TO TURN UP THE SHIELDING GAS FLOW, BUT I'M KEEPING ALL THE REST OF THE SETTINGS THE SAME. YOU CAN SEE WHEN THE GAS STOPS FLOWING THERE'S NICE COLOR CHANGE. AT THE END OF THE DAY IT'S REALLY NOT THAT HARD TO WELD STAINLESS STEEL. YOU JUST HAVE TO PRACTICE PROPER HEAT INPUT AND HAVE EXCELLENT GAS COVERAGE. SO SIT DOWN AT THE WELDING BENCH AND DO A LOT OF PRACTICING. (JEREMY)>> TRUCK TOOL BOXES HELP PREVENT YOUR TOOLS AND GEAR FROM DISAPPEARING, BUT IT CAN BE A HASSLE KEEPING UP WITH MULTIPLE KEYS AND DIFFERENT COMBINATIONS. BOLT LOCK MAKES IT EASY BY USING ONE KEY YOU ALREADY HAVE, YOUR TRUCK KEY. YOU CAN GET PAD LOCKS, TRAILER HITCH LOCKS, CABLE LOCKS, AND MUCH MORE. PLUS THEY'RE SIMPLE TO USE. JUST INSERT YOUR KEY, GIVE IT A TURN, AND THE LOCK PROGRAMS ITSELF TO YOUR KEY. THEY MAKE LOCKS FOR MOST POPULAR MAKES OF TRUCKS AND YOU CAN GRAB YOURS AT BOLT LOCK DOT COM. (LT)>> LEAKY ENGINE OIL SEALS CAN BE A PAIN TO DEAL WITH. THEY'LL MAKE A MESS OF YOUR DRIVEWAY AND BE VERY COSTLY TO REPAIR. A SIMPLE AND INEXPENSIVE FIX IS TO POUR SOME BARS LEAKS CONCENTRATED REAL MAIN SEAL REPAIR INTO YOUR ENGINE OIL. 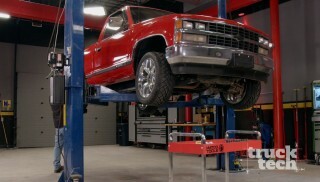 IT'LL QUICKLY RESTORE THE SIZE AND FLEXIBILITY OF OIL SEALS, AND STOPS MOST LEAKS WITHIN 100 MILES. IT WORKS GREAT ON REAR MAIN SEALS AS WELL AS TIMING COVERS, CAM SEALS, AND MANY OTHER HARD TO STOP LEAKS. PLUS IT WORKS GREAT ON ANY ENGINE, GAS OR DIESEL, USING CONVENTIONAL, SYNTHETIC, OR HIGH MILEAGE ENGINE OIL. GRAB SOME OR ANY OTHER BARS LEAKS PRODUCT AT YOUR LOCAL AUTO PARTS STORE. WE'RE NEXT DOOR TO GET A BASE LINE ON OUR RAM BEFORE WE TEAR INTO THE CUMMINS. THIS IS ALSO AN OPPORTUNITY FOR HOT SHOT'S SECRET TO PROVE ITS PERFORMANCE CLAIMS. WE DID FOUR RUNS ON THE STOCK SIX POINT SEVEN CUMMINS AND AVERAGED 339.5 HORSEPOWER AT THE WHEELS. I'LL THEN ADD THE RECOMMENDED ONE POINT FIVE OUNCES PER QUART OF HOT SHOT'S SECRET FRTHREE FRICTION REDUCER TO THE ENGINE OIL, AND TREAT THE FUEL SIDE OF THINGS BY ADDING EIGHT OUNCES OF THEIR DIESEL EXTREME INTO THE TANK. WE LET THE TRUCK RUN FOR 30 MINUTES, GIVING THE FLUIDS A CHANCE TO DO THEIR JOB. THEN MADE FOUR ADDITIONAL RUNS, KEEPING EACH PASS AS CONSISTENT AS POSSIBLE. (JEREMY)>> ALL RIGHT MAN, YOU READY FOR SOME NUMBERS? (LT)>> HEY I'M DYING TO KNOW HOW WE DID. (JEREMY)>> I'D SAY IT'S PRETTY IMPRESSIVE FOR JUST ADDING A COUPLE OF FLUIDS. WE GAINED 12.25 HORSEPOWER. (LT)>> YOU ARE RIGHT, THAT'S VERY IMPRESSIVE. THAT BRINGS THE TOTAL AT THE REAR WHEELS TO JUST UNDER 352 HORSEPOWER. NOW LATER ON THIS SEASON WE PLAN ON ADDING A LOT MORE POWER UNDER THE HOOD OF THIS RAM. PROBABLY A COUPLE HUNDRED MORE AT THE REAR WHEELS. 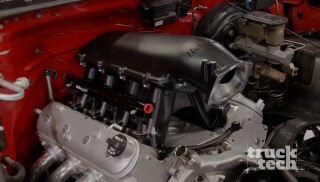 (JEREMY)>> YEAH FOR MORE INFORMATION ON ANY OF OUR BUILDS BE SURE TO CHECK OUT POWERNATION TV DOT COM.